Carrollton, TX — In modern day police state, USA, exchanging goods and services is a crime unless the state gets their cut. So, even though a Carrollton mother was “stunned” to find a warrant issued for her arrest for selling tamales to her neighbors — it was to be expected. This week, Dennise Cruz was shocked to receive a yellow postcard from the City of Carrollton stating that if she doesn’t immediately submit to their extortion demands, then she would be kidnapped and locked in a cage. “That has to be wrong. I don’t have any tickets under my name. That’s just my first reaction. Never would have I thought, tamales,” said Cruz in an interview with CBS DFW. “To know that somebody can be arrested over that, that to me is unbelievable.”. The yellow ticket was a “warrant arrest notice” stemming from Cruz’ illegal activity a few months prior. Cruz, obviously a hardened criminal worthy of police action, decided to make her famous tamales and post them on the app Nextdoor for sale. Her neighbors loved them. “It’s just so common. That’s why to me, I don’t understand why it’s such a big deal,” said Cruz. However, because Cruz did not pay the state to operate this business, their procedure is to rob her under the threat of violence. She was hit with a $700 fine. “When it hit me, I was like that is a lot of money,” said Cruz. When Cruz called the city to protest her extortion, the clerk told her that someone reported her for not having a food permit. However, this is not likely as only the government would know such things. “I don’t understand because if anything I would have rather them come to me first if they had any concerns,” said Cruz. The city of Carrollton maintains that extorting Cruz is in the interest of the people. 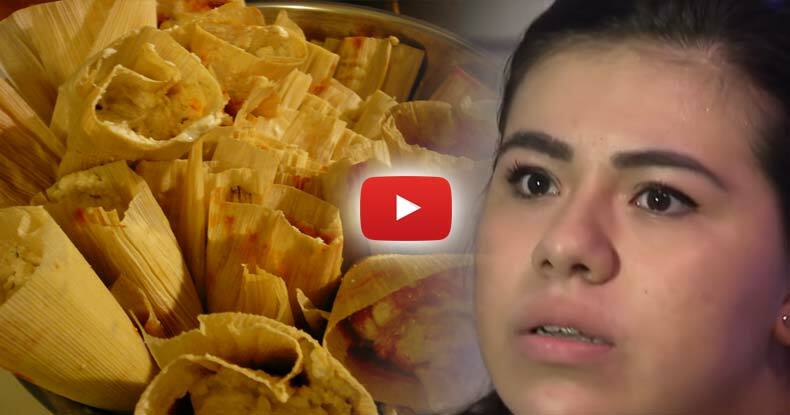 According to a city director, tamales are a danger to society. A director said a fine was issued and not a warning because tamales are considered “potentially hazardous food” due to the cooked corn and meat being used, according to CBS DFW. The good news is Cruz intends to fight this tyranny in court. Also, friends set up a GoFundMe account for her that’s made more than quadruple the amount she needs just to pay the fine — highlighting that Americans can’t stand this ridiculousness either. This absurd arrest warrant comes on the heels of an equally asinine incident, also in Texas, in which two young girls had their lemonade stand shut down by local cops for not having the correct permit. The good news is that, like Cruz, the girls refused to roll over and opened their stand up again the next weekend. Apparently, Texas officials take their motto Don’t Mess with Texas quite literally. Aside from threatening to arrest a young mother attempting to make ends meet by selling tamales and shutting down little girls’ lemonade stands, they’ll also throw you in a cage for having tall grass on your own property. Don’t take our word for it, however. Ask 75-year-old Gerry Suttle, who was stunned when she received a call from the local police chief, informing her that she had a warrant issued for her arrest — because her grass was at a length not desirable for the state of Texas. In April of last year, another Texas resident, Rick Yoes, was sentenced to 17 days in jail for the length of his grass. And some folks still have the gall to call this country the Land of the Free.